Providing exact bathroom remodeling costs is difficult, end even if you were to submit the same specifications to a couple of contractors for a quote, you'll see a (sometimes huge) discrepancy in price. A quick answer is: Anything from $5,000 to $30,000 (and more!) depending on what you want done, or as little as $2,500 if you'll be doing most of it yourself. We provide a detailed supplies and labor checklist lower down on this page to assist you with your bathroom budget planning. Copy it into your word editor or spreadsheet and delete the items you definitely don't need to make provision for. Then start visiting online suppliers to get a rough cost estimate of various items. This will very quickly show you where to prune (if necessary). Having detailed plans to work from also enables you to spread the purchasing of items over some time, assisting you with cash flow. Note though: colors in fixtures and fittings may differ between suppliers or batches - even whites may not be identical - so be sure to match your items for a professional look. 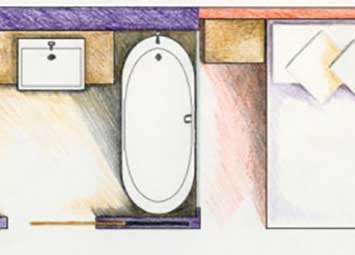 Cost of Remodeling a Bathroom when using a designer, which you should have a look at before writing the idea off. Using a contractor and depending on the scope of the work, can also add anything from $7,000 upwards to your costs, in addition to the cost of the materials. There are many online resources available where you can obtain free construction quotes. Labor costs for tiling, dry walling, painting, plumbing, wiring etc. where applicable must also be added to your budget. Sure, hiring professionals to do the work will add a lot to the overall bathroom remodeling costs, but it will save you time and disruption to your home life during your bathroom makeovers. And so, without further ado ...on to your itemized list. Be prepared to spend a bit of time on this! Start with your ultimate wish list - we'll take a look at cutting costs after that if necessary. Once you have a detailed list with associated costs, it will be easier to weigh up the advantages/disadvantages and to prioritize your spend. Yes, it will cost a lot to add a skylight, but it will bring in much needed natural light. Yes, you absolutely want the designer vanities because that is the focal point of the bathroom, but the heated towel rails and faucets can be substituted. 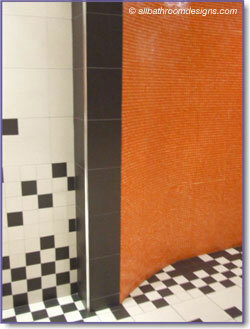 Use designer bathroom tiles in focal areas only or use standard tiles creatively to cut bathroom remodeling costs. 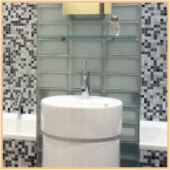 Have a look at our Bathroom Tile Ideas for inspiration. Yes, this does take more time, but you may just discover a beautiful (and less expensive) item on your shopping journey. Once you have your detailed list, you may also be able to negotiate a discount with a supplier if you buy all your items from them. Get estimates from a number of contractors (don't necessarily go for the cheapest!) and review their work before making your choice. 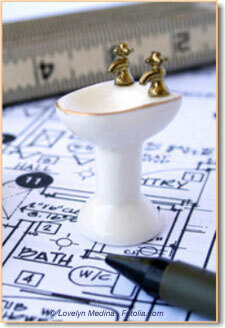 Make Provision for Unforeseen Bathroom Remodeling Costs! Apart from the above calamities, you generally need to add 10% to 20% to your budget to allow for cost overruns. 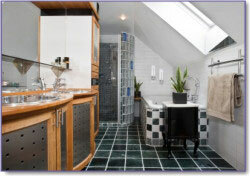 Remodeling bathrooms can be a costly exercise, but it is a great investment! Firstly and most importantly: In enhancing your lifestyle, by providing a well-deserved pampered experience after a long day's work. Secondly: Whilst you may not see a huge return on your bathroom remodeling costs when the property market is down, it will make you house more saleable than one whose bathroom needs an upgrade.